Well it has been a good few years since I was last on the forums. Since then, I have shifted continents from Australia to Europe, gotten married and have 2 step daughters and 1 of my own. I have missed my Elantra since the day I last drove it, and have been looking for one a few times a week for the last couple of years. 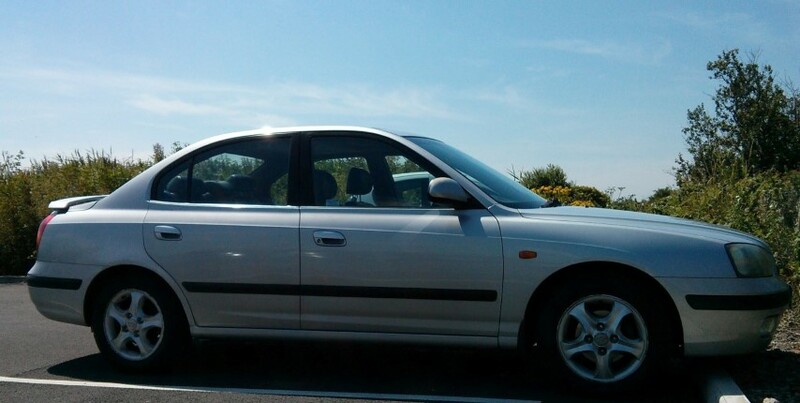 Originally I was set on getting an XD2, but this week a deal came up which I couldn't refuse; so now I'm the owner of a 2001 Elantra XD CDX 2.0L Petrol 5-Speed Manual with just under 80,000 miles on the clock. Special features compared to some US models include: Climate control, leather seats, electric sunroof, electric windows and mirrors, OEM spoiler with integrated brake light, wood effect dash, cheap and nasty aftermarket stereo with USB, AUX input and remote control. It drives well, but second gear is pretty much useless. I'm going to get a full service done on it soon with a change of all fluids and filters, as I have no service history from 60,000 miles. Also, I need to refurbish the alloys and debadge it as soon as possible and get some new tyres on it. Also need to get some new bulbs for it as well as a whole host of other things, but I'm not planning on spending a lot on it as I reckon the gearbox or clutch will need doing in the next 5-10K miles. Also, it is interesting to note there is no external antenna, so it has a really clean look to it! Hope it works well for you! The lack of external antenna is interesting. Is that factory? What does it have for an antenna? dang thas a good price.. miles? not km ? That is a sedan gt here in the US, minus the wood grain. Nice deal man. Clean it up and get some good pictures up. Hey Mark, great to see you back at the club! Congrats on the car and all the family milestones. Seems like a great deal to me. Welcome back! I remember you from back in the day! Thanks for the welcome back. It's great to see some familiar usernames and great that people are still loyal to the forum. Unfortunately personal circumstances have dictated that I need to put the Elantra into storage. I'm not selling it, that's for sure! The Elantra XD is the perfect car IMHO. I will never sell it, I will restore it to pristine condition and drive it around in 10-15 years time or perhaps even when I retire. I have organised someone to come and detail it properly for a full day, then a car cover will go over it. Some days I just like to sit in it, put the radio on, or remove a few interior or exterior panels for fun. The Elantra is more than just a type of car to me. I've driven high value BMWs, Audis, Mercs and Lexus sedans over the last decade, but have no desire to own any of them. I find them boring, and you see them every day on the road. Seeing an Elantra XD Sedan here is a rare occurrence. There were very few sold, which is why I feel the way I do about it. The Elantra XD's beauty is in its simplicity and ease of doing everything and anything to the car without a lot of effort. It is the car of my dreams, despite being able to afford cars in much higher price brackets. PS: The lack of external antenna is still a mystery. I plug in the antenna plug at the back of the head unit and it picks up very few stations, but I have no flipping idea where the wire goes to. I haven't bothered tracking it, but there is no evidence of any external repairs in the area where the antenna usually is.